The continuous mixer is based on the process of the mechanically generated turbulent fluidized bed, patented by Lödige. During this process, Ploughshare® shovels rotate close to the wall in a horizontal, cylindrical drum. Their peripheral speed and geometric shape is rated such that they take the mixing components off of the drum wall and toss them into the free mixing compartment from the product bed. In addition to its exceptional efficiency, part of the sophisticated mixer concept is the universal applicability of the continuous Ploughshare® mixer KM. Therefore, due to the continuous mixing of the entire product, intensive mixing is achieved even at extensive throughputs of material to be mixed. Product transport is ensured by the special shape and arrangement of the mixing elements. In this manner, an excellent homogeneity and consistent reproducibility of the final product is achieved during short mixing or residence times of only 25 to 60 seconds. In addition to its exceptional efficiency, part of the sophisticated mixer concept is the universal applicability of the machine. Beyond the processing of dry, powdery, granular or fibrous solids, it can be equipped for numerous other mixing tasks. The addition of liquids to moisten the product components is equally possible as the processing of pastes and liquids. 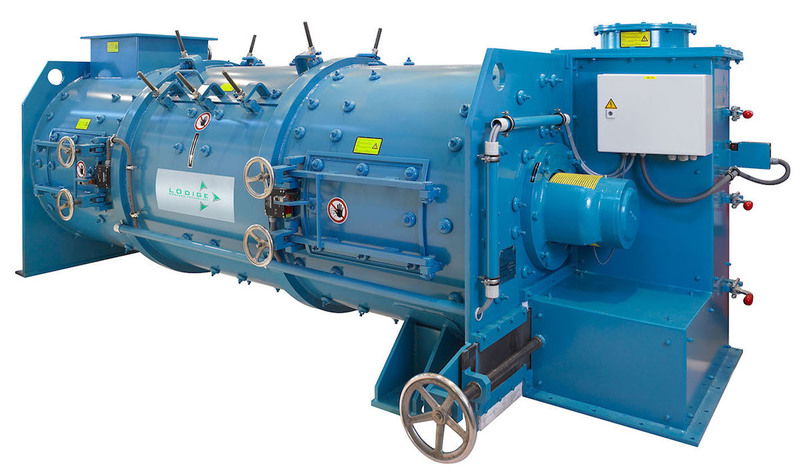 Furthermore, the installation of choppers in the mixing drum allows opening-up agglomerates and targeted granulation during the mixing process. A heated or cooled drum, head pieces and shaft are also available as equipment options. During times of particular demand, the highly wear-resistant surfaces, high-strength structural steels, stainless steels and special materials increase the high availability of the continuous Ploughshare® mixer even further. The versatility of the mixer is also underlined by the large selection of different sizes. The smallest model with a capacity of 5 litres has a throughput of 0.25 m3/h, depending on residence time and filling level. The throughput of the largest model with a drum volume of 57,000 litres is approx. 1,300 t/h. Visit Lödige at the IFAT 2018 – 14. – 18. Mai 2018 – Exhibition Centre Munich, Germany: Hall A4, Stand A4.441.